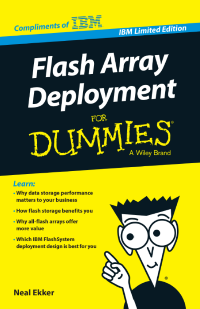 Download this exclusive eBook to learn more about the data storage limitations driving businesses to look at flash storage, its competitive and cost benefits, and considerations around implementing flash storage in your environment. Data storage systems play a crucial role in the ability for IT to support your business’s goals. But as the need to do more, and more quickly, cost-effectively using fewer resources, alternatives for storage technology must be looked at. Fortunately, solid state storage made from NAND flash memory chips has evolved to the point where many organizations are considering its use to replace inefficient, slow mechanical-spinning systems. Whether in ecommerce, government, financial services, science and technology or simply enterprises with cloud, mobile or social engagement requirements, database performance drives value—and flash storage systems simply perform better than old mechanical ones. Recent studies have shown also that overall IT costs can be lowered by embracing higher-performing storage systems.